Rangers manager Mark Warburton anticipates little change in Hearts’ approach at Ibrox on Saturday under new boss Ian Cathro. Robbie Neilson’s last game in charge of the Jambos before taking over at MK Dons was a 2-0 win over the Light Blues at Tynecastle last Wednesday night. After the Govan side responded with a 2-1 home win over Aberdeen at the weekend to move into second place in the Ladbrokes Premiership, the Edinburgh club confirmed Cathro as their new head coach, joined by Austin MacPhee, the Northern Ireland assistant. While much has been made of the appointment of the 30-year-old former Newcastle coach, who has never played or managed at senior level, Warburton is expecting Hearts to pose the same questions to which he hopes this time to have the answers. 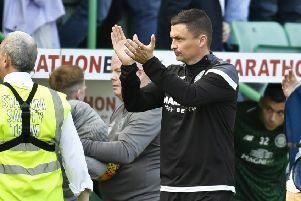 He told the club’s official website “You have to think that they will play a very similar game, they were quite rightly successful at Tynecastle, what we have to do is find solutions. “I don’t know much about Ian Cathro, I know he is highly thought of but no more than that. “If you are there for a week, I imagine if I was Ian I would do very much the same as the previous week when they have won the game 2-0 at Tynecastle, you’d want to try and repeat that. “Our job is to focus on Rangers and do what we do better, learn from last week, learn from Saturday as well and deliver a performance in what is a very important fixture. “We are at home off the back of a good performance, we are second in the league and we want to reinforce that and send the crowd home happy again. “We do that by being positive, getting on the football and doing everything we did on Saturday and hopefully adding some more quality balls in there as well. “The fans will be crucial, our home record is very strong and very solid and a big part of that is down to the backing.